A dynamic and engaged community of researchers producing world-class research with impact in society. contemporary and academically rigorous research training governance and advice. We are professional, well-informed, supportive and collaborative. Empowered and active research community - We contribute to building a community of researchers who are astute, ethical and engaged with their communities. Graduate research candidates are able to navigate the research and professional and ladscape and communicate the value of their research, addressing the big issues of our time. Professional development opportunities - We offer a comprehensive suite of research and professional development programs, and industry and community engagement opportunities for our researchers. This will greatly enrich their research experience and support their career paths, so that they can become leaders who positively influence the global community. Friendly and professional customer service - We aim to ensure a high-level service for all researchers, and offer a central point of support to graduate research candidates and supervisors, wherever they are based. Life-cycle candidature management - We maintain streamlined administrative processes and systems that ensure strong candidate support, quality supervision and consistent progress management throughout candidature. We continue to seek opportunities for review and improvement of processes and systems. Career-ready graduates and future leaders - Our graduates are innovative and creative thinkers able to develop solutions to rel-life challenges. they are skilled researchers who have acquired industry experience, and leadership, social and professional skills that result in rewarding careers. Timely completions - We work closely with candidates, supervisors and graduate research coordinators to ensure the timely completion of quality research degrees. Industry-relevant research training - We offer and Industry PhD program, industry mentorships and industry internships to our graduate researchers. We develop partnerships with private sector, government and not-for-profit organisations to ensure that our research training is relevant for industry and community, responds to industry needs, and enhances innovation. International partnerships - La Trobe maintains a strong global partner network and, through the Graduate Research School, develops and implements exchanges, joint supervision arrangements and collaborative programs with reputable overseas organisations as part of our suite of international opportunities for graduate researchers. Print a copy of our vision statement [PDF 336KB]. The GRS Melbourne office is based in the John Scott Meeting House. 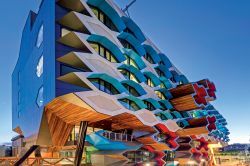 This location is the hub of graduate research activity for La Trobe's Melbourne Campus. The GRS Office at our Bendigo Campus opened in the first quarter of 2016. Opening hours and contact details are available on our contact page.